Coach four people through a habit or goal for up to a month using our Momentum Method. In addition to practicing the Momentum Method of habit coaching, this will help you become familiar with the platform and give you a chance to hone your coaching skills. See below for detailed instructions on promo codes. Go to Coach Settings, choose Individual Coaching Packages, go to Add a New Package. To complete the Add a New Package page, you may create your own name and description for the habit you’d like to coach. Don’t worry about making it perfect, all of this can be changed as you go along, but for now you want to get a habit posted so that your certification clients can hire you and you can start coaching! Be sure to choose Digital Habit Coaching which is the standard pricing option. Promo codes only work on standard-priced packages. Click Save at the bottom of the page. Once you’ve set up a habit, you can send your certification clients a link to your profile and your promo code (found under Digital Behavioral Coaching Certification in Coach Settings). *Be aware that this code for your clients is free forever, so if your client should become a paying client at the end of one month, you’ll need to ask them to cancel and re-subscribe. 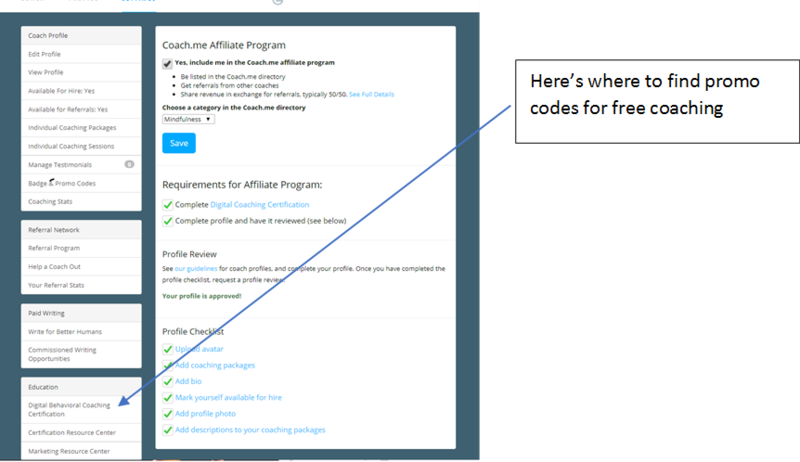 **Be aware that this code for you is only good for one month, if you wish to continue with your coach, the subscription will automatically renew. If you do not want to be charged, you’ll need to cancel. Here’s how to cancel.